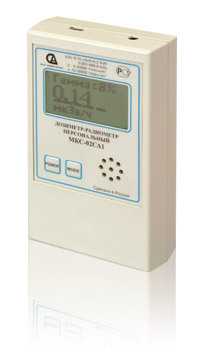 By its technical characteristics the MKC-03СА fully satisfies the requirements of the instructions of Central Bank RF №131-I from 04.12.2007. The instrument has been registered in State register of instrumentation under № 44593-10.
possibility of data exchange with a PC (via USB port). Speech output of dose rate measuring result Automatic with intervals 30s, 60s or 120s. LLC "SNIIP-AUNIS" (с) 2015-2018 г.